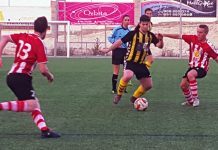 Home Football CD Montesinos Desperate Dolores draw with “Half” Monte. Very much like the proverbial “ferrets in a sack”, the battle for survival at the bottom of Grupo 8 is becoming increasingly fraught as games rapidly dwindle away. 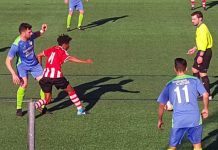 Sunday’s clash with CD Dolores took another twist with late drama and, yet again, a controversial decision by the man-in-the-middle. Montesinos lined up with yet more changes, centre back Dimitry keeping his spot along with Roberto, Diego & Carlos Lorente, returning from bans. Out injured were Morante and Maccan, while midfielder German serves a ban due to five yellow cards. 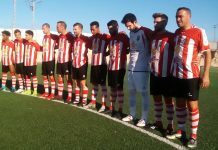 On the bench, new signing Jesus David from Algorfa made his debut in the red and white stripes. 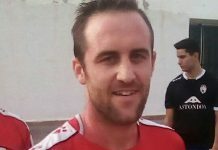 Also on the bench, returning from a long injury lay-off, was Josema. 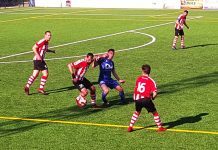 After the usual nervy start by both teams, it was Dolores who showed the better, with one or two quarter chances going begging. On 18 minutes though, Monte had the ball in the net, after exceptional work out wide from the ever lively Carlos Lorente, saw Vaz poke home, only for the referee to rule it out for offside. Again though, it was very much Dolores in the ascendency and they could consider themselves unlucky not to take the lead when on two separate occasions when one-on-one with Carlos they shot at him or high over the bar. The Monte back line was, to be honest, struggling to cope with the pace of the Dolores attack. So it was with some relief that on 35 minutes that, following a moment of true class by Carlos Lorente on the left, his zipped cross was met, first time, by Vaz, who slammed the ball into the net. This was, it has to be said, much against the general run of play, but Monte didn’t care about that. The second period commenced with, not for the first time this season, Monte on the back foot, conceding territory whilst hoping for breakaway goals. In the very first minute of play, Carlos had to be on his mettle to stop a rasping shot. It was clear from this that Dolores were very much up for this game. 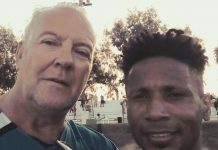 With Monte continuing to live dangerously and only occasionally threatening to penetrate their opponents goal, coach Ruben took off Roberto for the more defence-minded Pastor. The game had an edgy feel to it, with both sides minimising risks and only pressing forward when the ball broke. It had become a test of defences as much as a midfield battle. Dolores though, continued to have the better of what half chances fell their way and only a combination of bad luck and equally bad marksmanship left them without reward. 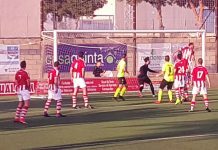 On 75 minutes, new boy Jesus David replaced the increasingly ineffective David, presumably to offer more guile and support to the, now all too infrequent, Montesinos attacks. Five minutes later, Dolores were level, but once again as in previous games, in controversial circumstances. 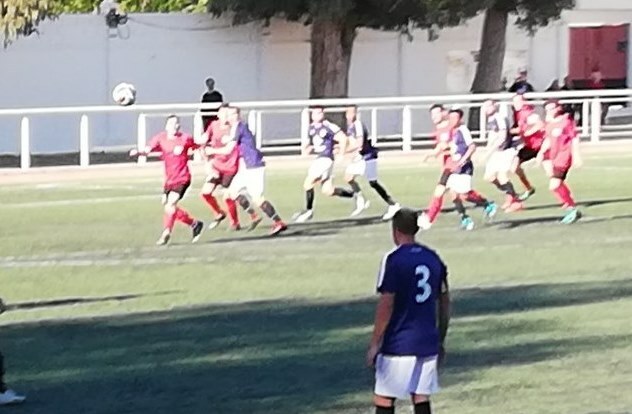 Following yet another right sided incursion, the attacker saw his goal-bound shot pushed away brilliantly by Carlos, only for the ball to be fired in again across the goal line towards a Dolores player standing next to the far post. He gleefully tapped the ball in (he could hardly miss this time from that range!) and the referee, who up until this point had a reasonable game, amazingly awarded the goal. After a flurry of (what had been absent until then) yellow cards, the game returned to its dismal ebb and flow, definitely not one for the purists. 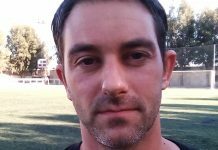 Bizarrely, following the award of a free kick in a central position, a Dolores player decided to remonstrate with the referee who subsequently gave him a second yellow and ordered him off. There then followed several minutes of too-ing and fro-ing as players came and went and the game as any kind of sporting spectacle diminished into a travesty. The final whistle blew and sadly, the official left the field surrounded by arguing and bickering players. A sad sight indeed and one that seems to repeat itself all too often. A miserable end to a miserable game. 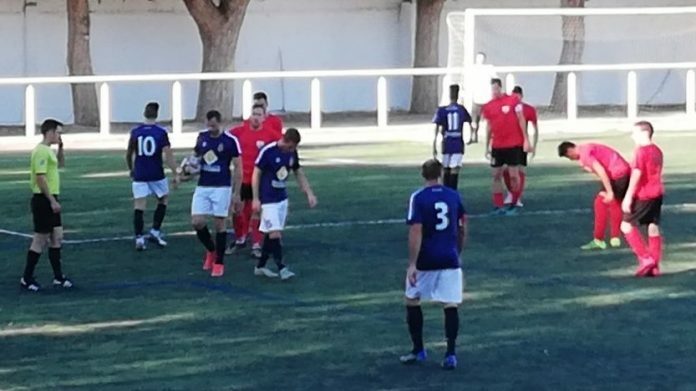 It could be argued that a point to Montesinos was marginally better than none and in a game where chances came and went, they could consider themselves lucky indeed not to have lost. But, at this late stage of the season almost anything is better than a loss, as teams below them will surely also have to gain points from where they have previously been unable. Perhaps a week off will give the team and the coach time to reflect and to come roaring back and play some football, as we know they can. We can only hope. Vamos Los Rojos, Vamos Monte! 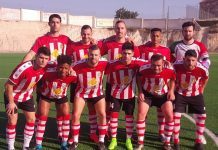 TEAM:- Carlos, Dimitry, Fernando, Manuel, Alex, Carlos Lorente, David, Roberto, Macia, Vaz, Daniel. SUB’s:- Sergio, Mario, Dario, Jesus, Jose. Previous articleA comedy of hilarious errors!